The title of the paper is The Comprehensive University: An Alternative to Social Stratification by Academic Selection  and it convincingly uses statistics and scholarship to make the case that a greater diversity of student talent at the beginning of a degree course would make for better outcomes at the end. Those outcomes are not only for individuals but benefit society more generally through growth, innovation and (though it sounds a bit cheesy) better understanding of other people. Whereas highly selective UK universities such as Oxford and Cambridge essentially recruit students who are very similar in class and achievement, the key idea in Blackman’s report is diversity. This is the diversity that occurs through opening up Universities to a greater range of abilities. At present Universities operate as end-points, finishing schools for already able students. They could be starting points: an opportunity to level out the playing field by teaching differently. Teaching differently involves taking advantage of diversity, and especially the understanding that occurs when different perspectives and experiences are used in learning . This type of learning depends on a shift from a ‘cognitive’ approach – where knowledge and reason are prioritized in teaching and assessment, to a practice or ‘competence’ approach – where opportunities are created for students to develop and reflect on a range of skills and abilities . Where diversity works best is when groups collaborate in constructing and defining problems, questioning the current order of things, exploring scenarios, and imagining solutions and consequences. All things that designers do well . Perhaps Blackman is thinking along the lines of how Arizona State University have used Design Thinking approaches to redesign their educational programmes and indeed the operation of the University . Perhaps, after a few false dawns, the time for design to play a greater role in higher education has come? Blackman’s paper is certainly a compelling read in this respect though the true difficulty for design remains in upsetting the design of the current order of things. 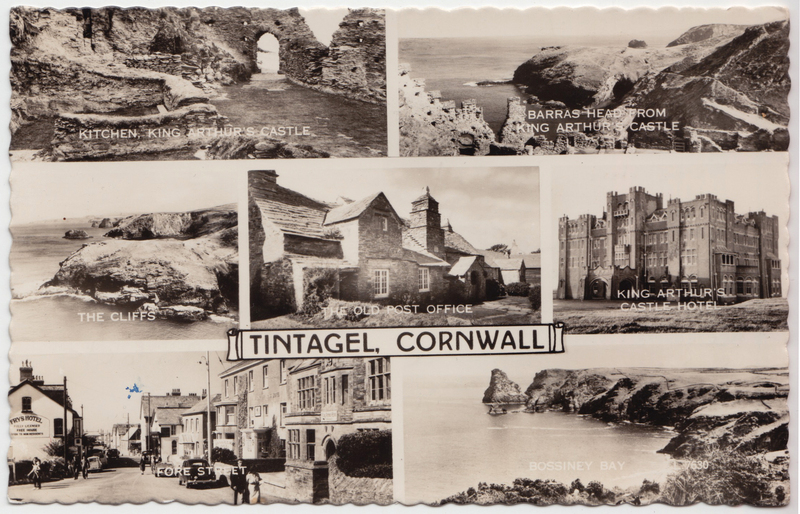 Postcard of Tintagel, Cornwall, with Fore Street shown in the bottom left frame (sent 1959). 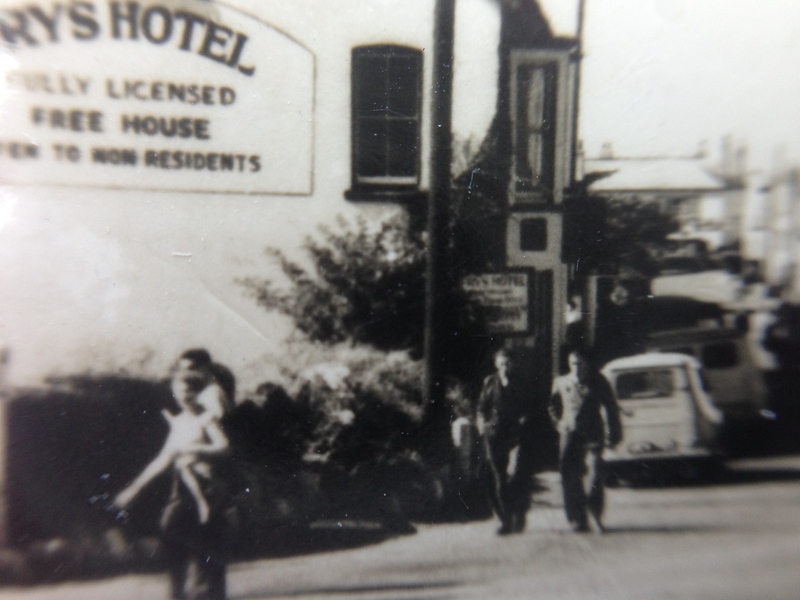 Close up of Fore Street, Tintagel, showing two men walking together. Taken with a macro lens and iPhone. The rendering of the image with the shallow depth of field captures beautifully the historic ‘feel’ of the scene. It could easily be a carefully composed photo taken by a local photographer. At first sight I thought the two men were wearing overalls – perhaps walking home from working at a local tin mine, deep in conversation. Closer inspection reveals both in suits, however, so the interpretation of the conversation shifts to one of business being discussed (perhaps about the local tin mine?). They look like they are walking home, to lunch or dinner, relaxed in each other’s company. It’s an interesting experiment comparing these images with modern day ones made from Google street view. In some ways the two processes – of making postcards and of producing street view images – are similar. 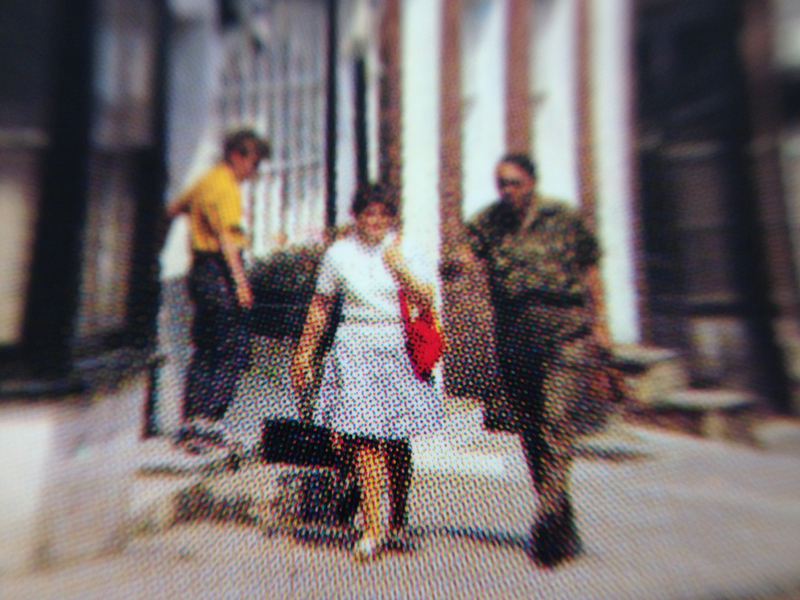 The people that figure in the background are equally unaware that they are being captured, and each image is a public one – sent through the post or digitally referenced. 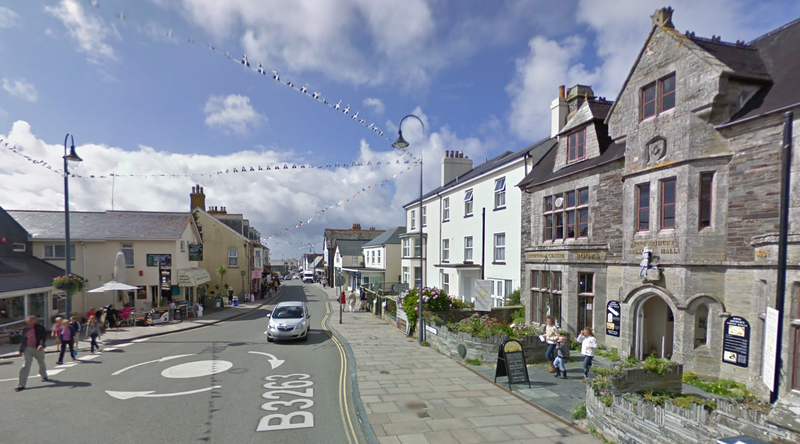 Google Street View screenshot showing Fore Street, Tintagel, Cornwall 2011. The town appears to have changed very little over the intervening years. The Hotels, both to the left and to the right in the original postcard image, are no longer hotels; pavements have been added, telegraph poles removed, and of course the cars are modern. But the rhythm of the built form; the mullioned windows, bay fronts, and roof angles – the essential structure of the place – remains. Close up of the Google Street View screenshot showing the people bottom left in the image above. The people, pixelated by the digital zoom and anonymised algorithmically by Google, are distinct only in their forward movement; some look like holiday-makers though there is a man in a dark jacket who looks purposeful and businesslike, a distant echo of the two side-by-side men in suits. He appears as a leader, the others following him either to be saved or led to their doom. 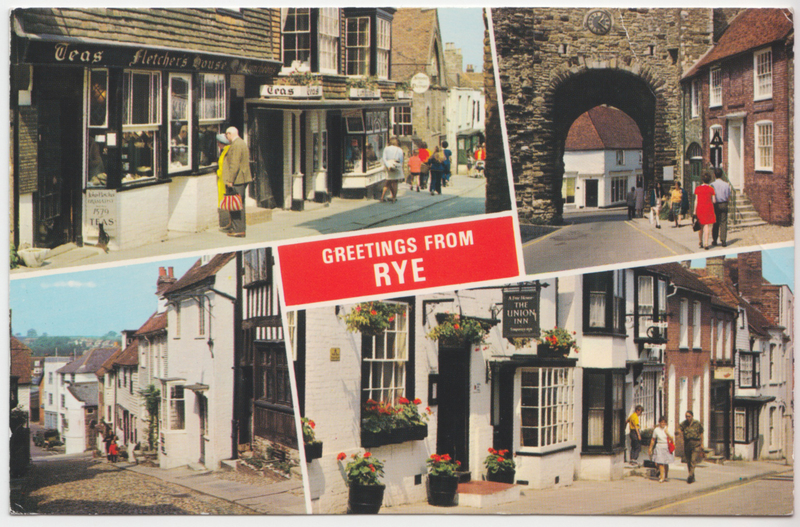 Postcard of Rye, East Sussex. The bottom right frame shows East Street (circa 1970). Close up of Postcard photo showing three people on East Street, Rye. Taken with a macro lens and iPhone. In contrast to the Tintagel scene the shallow depth of field in the macro-shot doesn’t reveal a ‘photo-within-a-photo-within-a-postcard’ but a scene made impressionistic by revealing the pattern of colour making up a half-tone print. Outside of the area of focus the photo looks normal, but it takes on a painterly quality as the focus sharpens, abstracting the two figures in almost pointillist fashion, patterning the women’s skirt in the foreground. The scene shows a couple walking towards the camera, while a younger man with teddy-boy hair and turned up trousers exits a door behind them. The couple have baggage with them. The woman holds a red handbag in her left hand while dragging a suitcase. The man, seemingly dressed in military fatigues, holds a bag in his left had while gesturing with his right. Perhaps they are on their way to the station after a weekend away – did it go well? It’s difficult to tell, though there is a feeling of slight disconnection or unfamiliarity between them – the man and the woman don’t quite fit as a couple. 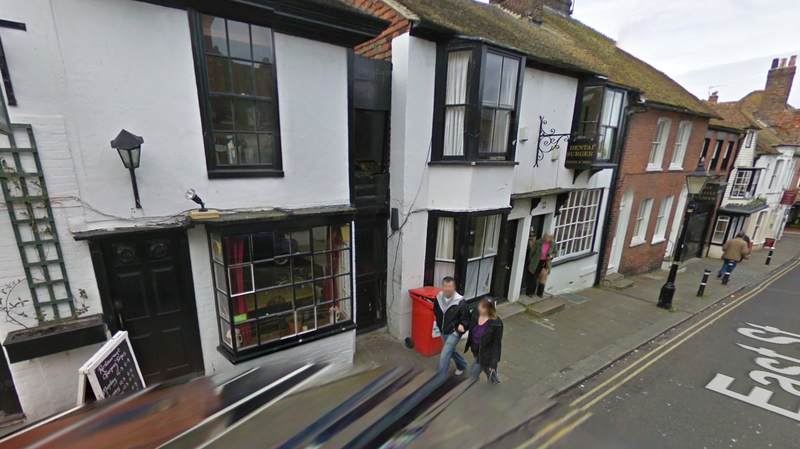 Google Street View screenshot showing East Street in Rye, East Sussex, in 2009. 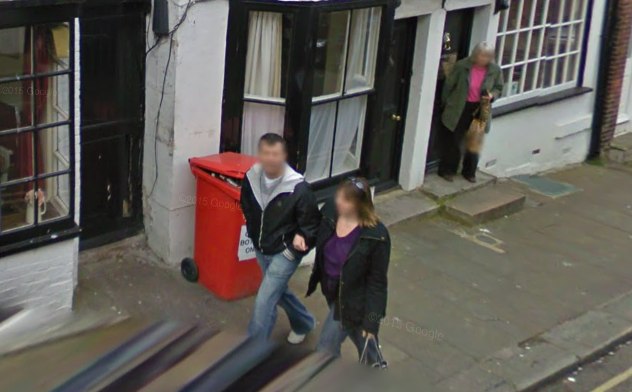 Close up of people in East Street, Rye, East Sussex from Google Street View screenshot. 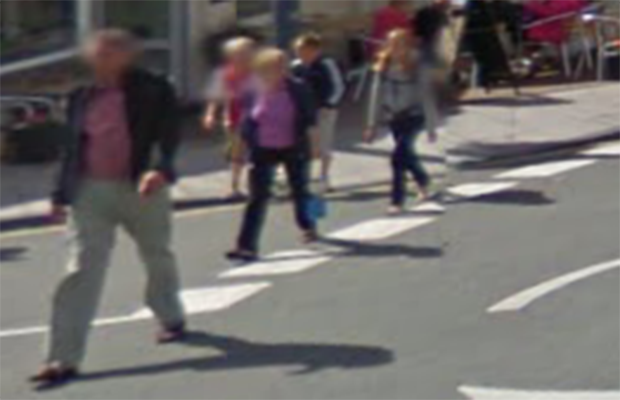 This time the man of the couple looks up at the camera (the Google car is a strange beast to behold) while arm-in-arm with his partner who carries a handbag. The woman exiting the dentist does so carefully, waiting on the top step before venturing further, perhaps slightly in pain from the dentist’s poking around; recalling where to go next. There is a stability revealed in these various fragments and stories, of slow-changing environments with familiar rhythms and uses, and of age-old behaviours, interactions, and movements. The public facing camera that ostensibly documents and replicates place reveals all kinds of other things about the daily lives of people who populate those places. One only has to look with a magnifying glass (or digital zoom) to find that, in many English towns, the more things change, the more they stay the same. Emerging into the light after passing under the A12 in Essex. A model in the sickbay at Kelvedon Hatch. Coming out into the light after visiting the weird Kelvedon Hatch top secret government nuclear bunker. How Can a Designer do Nothing?